I am really happy to list some more beautiful Dachshund items from our dear friend Sabrina Su (Beanie Su). Wanted to share a little photo gallery with you. This little red Dachshund sits on a pedestal marked "I Love My Dachshund:"
This sweet photo magnet has a red Dachshund and her black Dachshund buddy - so sweet! New with Tags -- Dachshund hot dog socks by Cherokee in pale pink. What cute Dachshund slippers in soft pale yellow! A little red Dachshund watches a butterfly at play. 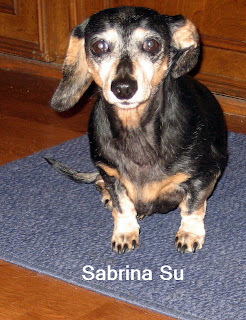 And this is our adorable friend Sabrina Su (Beanie Su), who just celebrated her Sweet 16 birthday! You can find all these great Dachshund items -- with many more -- in my store at: special Dachshund listings at Birdhouse Books.